Welcome to Mullaby, North Carolina, a town where the air is permanently sweet with hickory smoke and fairy-tale folk walk the streets: there’s an elderly giant, shy and lonely, and a young girl to whom the scent of baking cakes is visible as silver sparkles in the air. Strange things happen in Mullaby: frogs jump out of dryers, bearing messages from the dead, wallpapers change pattern to match people’s moods, and beautiful white lights dance through the trees at dead of night. When recently orphaned Emily Benedict arrives in Mullaby to live with her grandfather, she is intrigued by the cobwebby chandeliers, the dusty, echoing rooms, and the overgrown grounds of the family property, which, like Sleeping Beauty’s castle, seems suspended in an enchanted sleep. Except that the Princess – her mother, Dulcie – vanished a long time ago and no-one seems to want to talk about her. In fact, the attitude of the townspeople towards Emily is inexplicably hostile. What happened all those years ago, Emily wonders, to make her mother leave her hometown and never again return, or even speak of it? And why do the Coffeys, whose feelings against Emily are particularly strong, never go out at night? Emily’s only clues to her mother’s mysterious past are the initials carved all over town, leading from the wooden posts of the gazebo in her grandfather’s garden to the bandstand in the town park – whose crescent-moon weathervane is the exact replica of the one on the silver charm bracelet Emily inherited from her mother. With Win Coffey’s help, Emily gradually unearths the truth about a tragedy that took place almost twenty years ago and changed her mother’s life forever. In her latest novel, Sarah Addison Allen gives a Southern twist to the traditional Romeo and Juliet story of feuding families reconciled by young love: the Ferris wheels and food vendors of the annual Barbecue Festival take the place of the Capulets’ ball, while the uncommon legacy of Mullaby’s first seventeenth-century settlers introduces the magical element which has become a trademark of Allen’s writing. 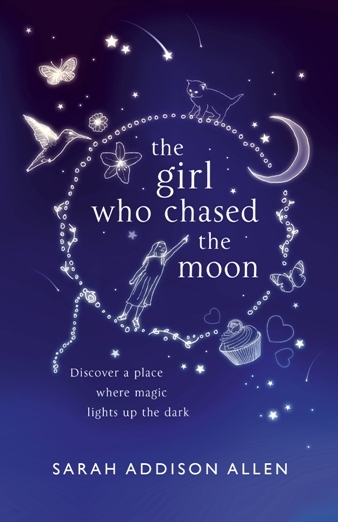 Themes already explored in Garden Spells recur in The Girl Who Chased the Moon, most notably those of the relationship between mothers and daughters, and the difficulties of returning to one’s hometown after a long absence. While many of Allen’s ideas are good, and several passages are well-executed – in particular those concerning Julia Winterson’s troubled adolescence – some characters, starting with Emily herself, do not ever really come off the page, and the story stays rather superficial. The image of Emily standing out on her balcony in her nightdress at midnight, fascinated by the elusive white light flitting through the trees on the edge of the neglected garden, immediately caught my fancy, with its poetry of moonlight and dark, secret shadows. It called forth echoes of Maria Merryweather, in Elizabeth Goudge’s The Little White Horse, standing at her casement and seeing a luminous pearl-white horse appear briefly on the moonlit lawn of Moonacre Manor before disappearing into the forest. Maria, too, must solve a mystery and bring together two long-estranged families. But where Maria’s quest for the Moon Princess’s vanished pearls is a masterpiece of imagination, poetry, and layered meaning, Allen’s tale does no more than scratch the surface of its possibilities. The mystery is too easily solved, and in my view, suffers from a fatal act of clumsiness: for if anything is guaranteed to dispel poetry and enchantment, it is the words “genetic mutation”, used to explain the glow the Coffey men emit by moonlight. Scientific language does not belong to the realm of fairy-tales. Away fly romance and magic, and in their stead visions of pulsating radioactive fish and extra fingers and toes rear their ugly heads. Highly regrettable. Most of all, it is a pity Sarah Addison Allen did not make more of the moon symbolism and the image contained in her beautiful title. After so successfully reworking the symbol of the apple tree in Garden Spells, I expected her to do something better with this. All in all, The Girl Who Chased the Moon was a bit of a let-down. This entry was posted in Book Reviews, Fiction and tagged fairy-tale, food, magic, moon, mystery, South. Bookmark the permalink. How is it it’s taken me decades of searching for people who’ve even heard of the books I like and yet when I finally take to the internet, there you all are! Have you read any of her adult work – ‘The Scent of Water’ is another favourite. I’ve only read one of her adult novels so far: The Castle on the Hill. I enjoyed it but I thought it was flawed, and definitely not as out-and-out brilliant as The Little White Horse. I’ll have to try The Scent of Water, though – if only for the title, which is lovely! I must say, I resisted email and social networks for a loooong time, convinced they were the end of civilization, but blogging was a revelation! I’ve had so much fun chatting to bookish people and discovering all sorts of wonderful books I would never have heard of otherwise!